2018 Day 21 & 22: Start Building! The team "huddle up" discussion last weekend set strong overall-direction for the robot. Then the design team followed up with a strong push early this week. All eyes turned to the manufacturing war-machine of the Robowranglers - and it did not disappoint. At the end of Day 21, the first parts arrived and kicked-off one of the most special weekends of the Robowrangler season: "Sheetmetal Christmas." The #AllBlackEverything tree is out, the holiday music is playing... a calm falls over Greenville - The Robowranglers are riveting. Sheetmetal Christmas has arrived. Since Innovation First, International (one of our sponsor companies) values prototyping early in the design as critical to success, many of their facilities and resources are built around providing fast manufacturing. Our team's access to these resources is the only reason our process is able to run the way it does, and the Robowranglers are incredibly grateful for the support we receive from IFI and their manufacturing division IFMI. A few years ago, I would joke with people: "We're one of those bandsaw and drill-press teams, we luckily also have access to a full sheet-metal production facility!" Since then, things have changed a little bit. To understand the Robowranglers, it's important to understand our process. I've talked a lot about our design process. It is heavy on strategic analysis, prototyping, detailed design, and iteration. This type of process is only possible because of the resources which allow us to allocate very little time for actually making parts. Our primary robot construction method remains sheet-metal manufacturing. I imagine most FRC veterans could pick our robot out of a police line-up, without team numbers on it. Black laser-cut sheetmetal, angular truss patterns, subtle (and not-subtle) nonagons. This is enabled by the Innovation First Manufacturing, Inc. (IFMI) shop. Lots of dislikes on this video - I guess some people don't like "How It's Made"? 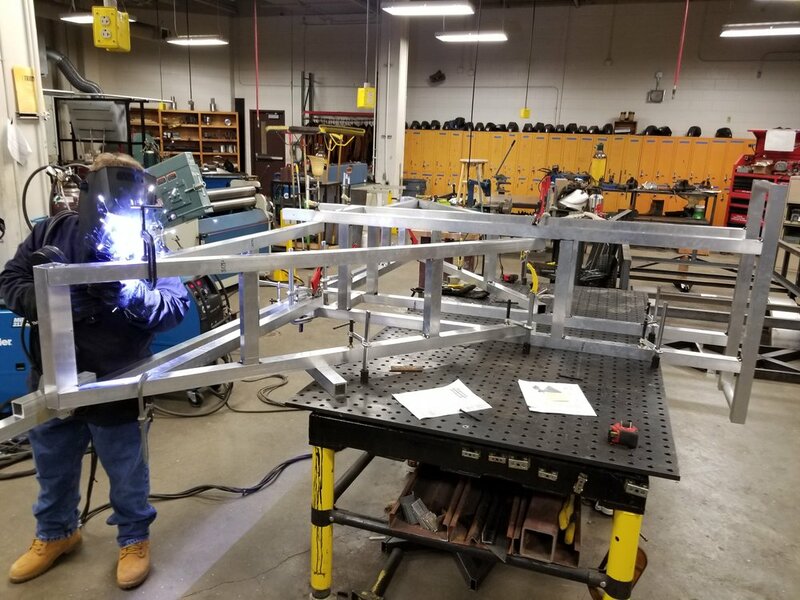 We can typically get sheet-metal back quickly: A single part can be cut, bent, powder-coated, and returned to 148 within a single work day. A larger "drop" of parts will take a few days. The initial sheet-metal release for our 2018 robot (including practice robots and spares) was sent on Wednesday morning, and completed Friday afternoon. Since 2016, we've been using more and more Lexan (cut on a CNC router) in our robot construction. IFI purchased a router-table for use in prototyping (it actually spends most of it's time cutting cardboard for packaging mockups). The Robowranglers love using it to make flat Lexan parts, since it enables VERY fast production of new designs. Faster production means faster iteration, which means quicker failure, which means more opportunities to grow and improve. "What do you mean we need to wait 24 hours for sheet-metal? I can go cut Lexan right now." We've also started using this to make "high fidelity" wood prototypes early in the build season. The above video shows us cutting a Mk2 intake prototype. The relaunch of the VEXpro product line in 2013 was a big deal for the Robowranglers. I know "the COTS revolution" it didn't impact our team as much as many other teams, but we were still impacted. Many of the things we used to make ourselves are now available for purchase. In fact, many of the VEXpro items are based on techniques the Robowranglers pioneered years ago - it makes it very convenient for us. IFI has a variety of 3D printers, and the Robowranglers have access to them (in moderation). The team has been trying to use more 3D printed manufacturing on our robots in the past few years. In particular we've been heavily inspired by 118 and the crazy things they do. Every time I talk to those guys they teach me something new, and I have some "I wish we had thought to try that" moment. We've been able to use the GHS machine shop and wood shop since I've been on the team, and have always done some manufacturing there. In addition, the Robowrangler shop has always had some small manufacturing tools (drill press, band saw, etc). A big change came with the opening of the new GISD CTE Center at the end of 2016 with the new Robowrangler lab at it's heart. The new lab has machine shop specially designed to provide the things we need that supplement our sheetmetal manufacturing. Parts being made in the machine shop in the Robowrangler lab. Fun fact: "Lathing" isn't actually a word. I've been told you should say "I'm turning parts" not "I'm lathing parts." Thanks to Colin Nobles for teaching us this! Another fun fact: We totally ignore this thing which Nobles taught us, and still use the term "lathing" ALL the time! A THIRD even MORE fun fact: I decided to fact-check Nobles before I posted this blog, and it turns out he's wrong! SO THERE. "Sheetmetal Christmas" is a magical weekend for a few reasons. First of all, we're in awe of the speed of our manufacturing sponsor. After weeks of discussion, debate, and design it is wonderful to see the visions translated from CAD into reality. It's especially powerful because of how fast it happens. It literally feels like Christmas to have all these "presents" show up. The second reason this weekend feels magical: this is the first time we've seen our 2018 robot come together in real life. Many teams have been building parts of their robot since the first weekend. Before Day 21 we literally had nothing built. We've done a lot of prototyping. We've done a lot of foundational work - but the "robot parts" corner was completely empty when Day 21 began. While their sister was busy building drivetrains, the Freeman boys were running some sort of scoring simulation on the field. I think we're starting to understand why Adam is one of the best coaches in the history of FRC*. * - Choose whatever metric you want. If you're asking for my opinion: Adam wins. We were happy to host our first visitors of the season! Today team 7179 from Garland, TX came to hang out in the shop and work on their drivetrain. They seem to be off to a good start so far. It's a shame... they saw our robot under construction so we had to lock them in "the bunker" with the classic cars. I'm sure they'll have plenty of time to get their robot completed down there. We're giving them lots of popcorn. Robowranglers help Crossfire get up and running. We gave them an extra battery box. It comes in black, with a Nonagon already on it... so they've got that going for them. Their team name is "Crossfire" which sounds really cool, but because their team number is 7179 I probably won't ever stop calling them "Beatty Krunch". They should probably just get on this bandwagon and change their name now. Our "bad?" behavior has contaminated 7179. There are so many parts and tools labeled "Bad?" in the 148 shop. We could do a really messed up give-away. "We'll give you all this stuff, but we have no idea if it works. You interested in rolling the dice?" In Dallas last year, we also met this very nice team 6768 I know as "HOT-town Thunder". Maybe we'll all get to play together. If anyone out there from team 7120 - The ThunderChicas is reading this. I don't know anything about your team. I only know your team number and name, since I saw it on the Dallas Regional list. Knowing nothing else: I love you a lot and we should definitely play together. Whoever on your team had the FRC-awareness and sense of humor to choose this branding... I salute you. Please reach out. The Robowranglers would like to chat! If anyone reading this knows the ThunderChicas, point them our way. Side Note: If team 4111 comes to Dallas, I will do everything in my power to make this alliance happen. If anyone needs some numerical help with: "the joke". I bet team 841 is thinking "Why is 148 a part of this alliance?" This is "Matilda". She was our shop-dog today. She looked very grumpy the whole time and that made us love her more. I wish we had a shop-dog every day. After dinner when it was time for Matilda to go home, she refused to leave. They had to literally carry her out. I've never seen anything like it: a grown man carrying a giant bulldog out with her legs locked, desperately squirming to get back into the lab. Is this a metaphor for the robotics stockholm syndrome? I think their human player's "exchange" technique needs a little work - in their defense, the exchange ramp isn't there yet. Both drivetrains handled very well. I think 7179 is off to a heck of a start and is on pace for a great season. I told them based on what we know now, they're definitely at the top of my pick-list for the Dallas regional (well, #2 behind the ThunderChicas). Unfortunately for them - no one on our scouting team lets me have any input on our pick list. It's better that way, I totally understand the decision. The Robowranglers also got our Mk 4 intake built up and mounted on a testbed drivetrain. It performed very well. It's good enough for us to tune in the details and prepare for the Mk 5. As we say on 148: "The Bones are There". Intake iteration and Mk5 design. Lift design is completed - Get parts made, built lifts. #1 Robot - Figure out where the roboRIO is going to go. You see, there is something Ms. Emerson "the boss" doesn't want me to talk to you about, so I needed to find a channel outside her control. What is that one thing? I have unconventional feelings on brownies due to my upbringing. For my entire childhood, my mother made brownies in a very specific way. Very few other people do it like this. I'm not saying the deserts we get aren't great. They ARE great. All the mentors on the Robowranglers are incredibly well-fed and very VERY appreciative of the time the parents spend on making us amazing team dinners and treats. That said... I want to openly encourage a resurgence of the "Raisin Brownie" revolution. Most people who try them, love them.